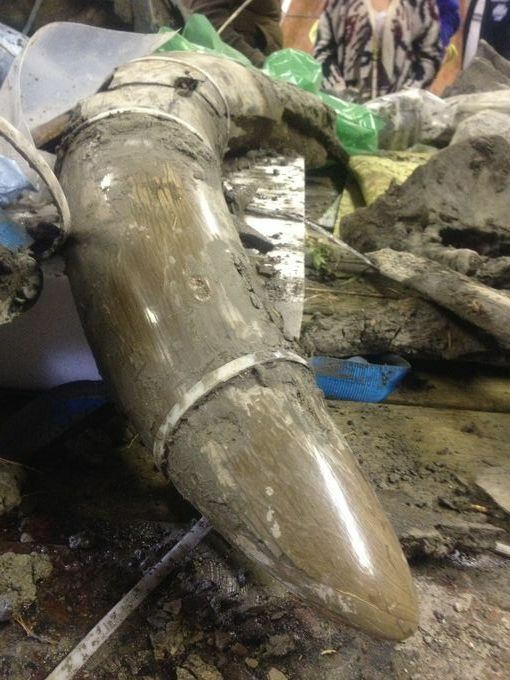 Yahoo News, Oct 2, 2015 -- James Bristle and a friend were digging in his southern Michigan soybean field when they unearthed what looked like a bent fence post, caked with mud. 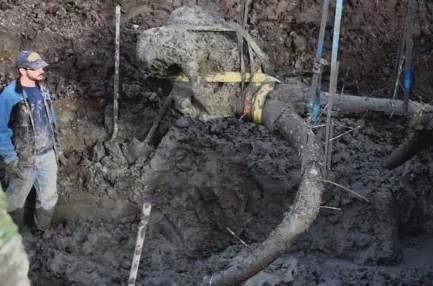 Instead, it was part of a pelvis from an ancient woolly mammoth that lived up to 15,000 years ago. 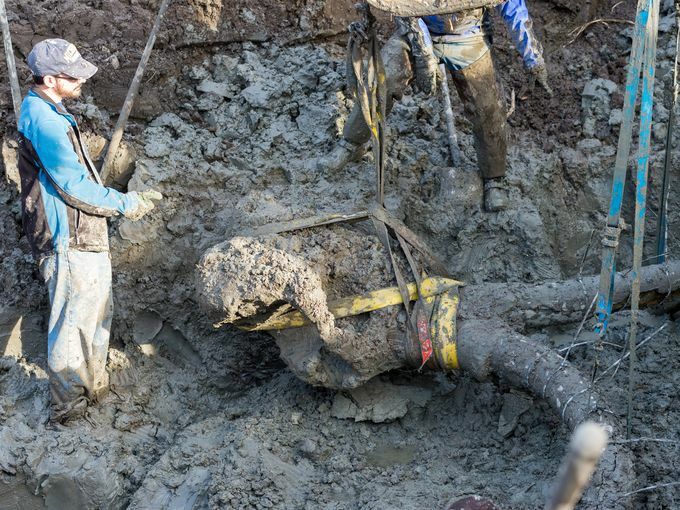 A team of paleontologists from the University of Michigan and an excavator recovered about 20 percent of the animal's skeleton this week in Washtenaw County's Lima Township. Aside from the pelvis, they found the skull and two tusks, along with numerous vertebrae, ribs and both shoulder blades. 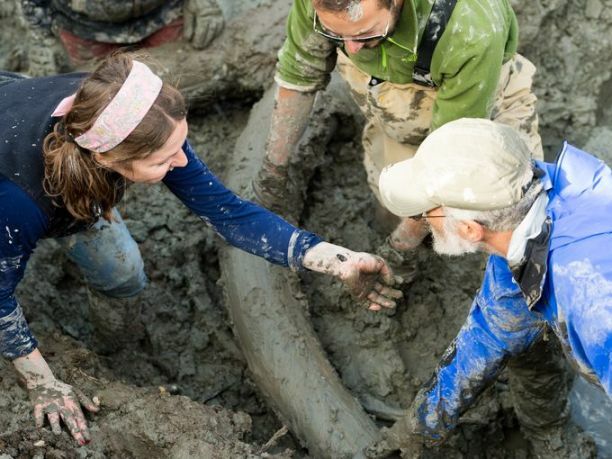 "We think that humans were here and may have butchered and stashed the meat so that they could come back later for it," Daniel Fisher, the scientist who led the dig, said Friday. Three boulders the size of basketballs found next to the remains may have been used to anchor the carcass in a pond, he said. Mammoths and mastodons, another elephant-like creature, were common in North America before disappearing around 11,700 years ago. 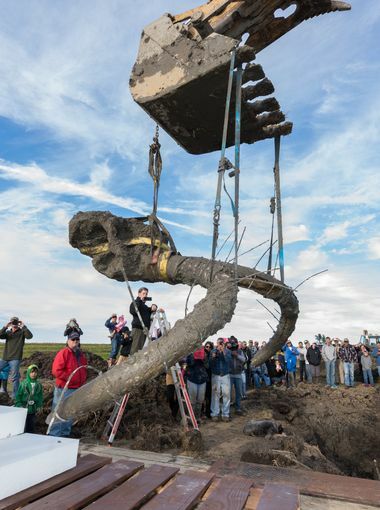 Remains of about 300 mastodons and 30 mammoths have been discovered in Michigan, Fisher said, although most of the mammoth finds aren't as complete as the one in Bristle's field. Bristle told the Ann Arbor News that he bought the property a couple of months ago. He and his friend were digging to make way for a new natural gas line when they found the odd object. "When my 5-year-old grandson came over and saw the pelvis, he just stood there with his jaw wide open and stared. He was in awe," Bristle said. The bones will be cleaned and examined by university researchers for cut marks that would indicate human activity, Fisher said. Study of the bones may shed light on when humans arrived in the Americas, a topic of debate among archaeologists. The appearance and behaviour of this species are among the best studied of any prehistoric animal because of the discovery of frozen carcasses in Siberia and Alaska, as well as skeletons, teeth, stomach contents, dung, and depiction from life in prehistoric cave paintings. 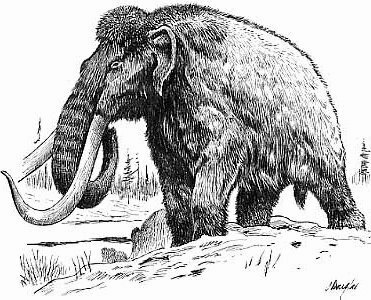 Mammoth remains had long been known in Asia before they became known to Europeans in the 17th century. The origin of these remains was long a matter of debate, and often explained as being remains of legendary creatures. The mammoth was identified as an extinct species of elephant by Georges Cuvier in 1796. The woolly mammoth was roughly the same size as modern African elephants. A newborn calf weighed about 90 kilograms (200 lb). The woolly mammoth was well adapted to the cold environment during the last ice age. It was covered in fur, with an outer covering of long guard hairs and a shorter undercoat. The color of the coat varied from dark to light. The ears and tail were short to minimize frostbite and heat loss. It had long, curved tusks and four molars, which were replaced six times during the lifetime of an individual. Its behavior was similar to that of modern elephants, and it used its tusks and trunk for manipulating objects, fighting, and foraging. The diet of the woolly mammoth was mainly grass and sedges. Individuals could probably reach the age of 60. Its habitat was the mammoth steppe, which stretched across northern Eurasia and North America. The woolly mammoth coexisted with early humans, who used its bones and tusks for making art, tools, and dwellings, and the species was also hunted for food. It disappeared from its mainland range at the end of the Pleistocene 10,000 years ago, most likely through climate change and consequent shrinkage of its habitat, hunting by humans, or a combination of the two. Isolated populations survived on St. Paul Island until 6,400 years ago and Wrangel Island until 4,000 years ago. After its extinction, humans continued using its ivory as a raw material, a tradition that continues today. It has been proposed the species could be recreated through cloning, but this method is as yet infeasible because of the degraded state of the remaining genetic material.